After a pretty good UFC 208 card, while at the same point disappointing due to the Khabib Nurmagomdov against Tony Ferguson fight getting scrapped along with the lackluster and at times boring main event between the Welterweight Champion Tyron Woodley against Stephen “Wonderboy” Thompson, the UFC is back in action in Fortaleza, Brazil. Jeez, that was the run-on of run-on sentences! 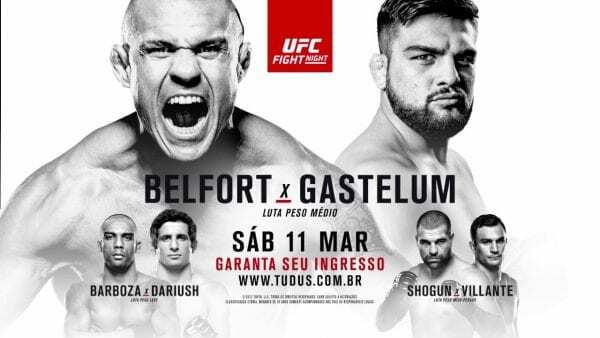 Anyways, headlining the card is UFC legend and former Light Heavyweight Champion Vitor Belfort against TUF 17 winner Kelvin Gastelum. Basically, it’s the old lion against the young lion. And the old lion desperately needs a victory to stage off the vaunted word “retirement”. For Gastelum, a win over Belfort will not only be a resume booster, but will vault him up significantly in a crowded Middleweight division. Co-Headlining the card, is the Former UFC Light Heavyweight Champion Mauricio “Shogun” Rua against brawler Gian Villante. In my opinion, either someone gets finished in this fight or it will be a sloppy affair that’s spotlighted when cardio runs out for both men. 185 lbs. : Vitor Belfort vs. Kelvin Gastelum – Man, this could very well be the end of a legend. Belfort, is on a two fight skid, both in which he got finished. Granted, it was against two top Middleweights in Ronaldo Souza and Gegard Mousasi. However, he didn’t even look reportedly competitive in either. His combatant, Gastelum has looked amazing of late. I mean, I thought fighting Tim Kennedy was a stylistical mistake. However, he looked like a legit threat in the Middleweight division, easily picking apart Kennedy in the grappling and striking department. It was a huge victory and it showed me that this is a guy who’s going to be a tough out for anyone. As for a prediction, I got Gastelum. As long as he fights smart and avoids Belfort’s spurts in the first round, then he should easily win. Belfort is also sneaky off his back and Gastelum isn’t exactly Souza or Mousasi with top control, so he could pull of a submission. The more I think about it, Belfort has a legitimate shot in the fight. However, his cardio fails after the first round and in an arena without AC, it’s only a matter of time before Gastelum puts him away. So with that, I got Gastelum via second round TKO! 205 lbs. : Mauricio Rua vs. Gian Villante – Man, as much as I believe Villante can win this, I just can’t see him fighting smart to do it. He’s a willing brawler and the last thing to go in a fighter is power, which is something that Rua is known for. Again, I want to pick Villante, but he fights without caution too much for me to pick him against a weathered Rua. So with that, I got Rua via KO! 155 lbs. : Edson Barboza vs. Beneil Dariush – Aww yea! This is going to be a fun fight and clash of a pure striker in Barboza against more well rounded fighter in Dariush. And that’s not take away from Barboza, who can handle himself on the ground, but he prefers to be on the feet. I mean, his takedown defense is solid and it’s entirely used to keep the fight on the feet, where he looks to lands devastating leg kicks. Think Jose Aldo, but 10 pounds heavier. As for Dariush, he’s a technical and precise striker. He’s not going to overwhelm you or knock you with one clean punch, but he will pick you apart for three rounds. His grappling is also great and if he happens to get his opponent on the mat, his top control is suffocating. As for a prediction, this is a tough call. Barboza can wilt any fighter with his leg kicks, but Dariush can mix in striking with takedowns en route to victories. Ughh, I guess I’ll take Dariush via decision. And I believe that he will do what Michael Johnson did and pressure Barboza. It’s the only way to really neutralize his leg kicks. 125 lbs. : Ray Borg vs. Jussier Formiga – So, at first I was all about Ray Borg winning this fight. I think his grappling and transitions on the ground are phenomenal and I have no doubt that he’s going to contend for the belt at some point. However, I then realized that Formiga is also a phenomenal grappler and his striking is light years better than Borg’s. And not to disrespect Borg’s striking, as it looked way better in his last fight then against Justin Scoggins, but it’s still a work in progress. Formiga has been fighting for almost 12 years and has been a top five Flyweight for over eight years. This is not a slouch and I think he knows he’s close to a title shot in a thin division. A win over Borg should have his name in the mix and I think he gets it done via decision. 135 lbs. : Bethe Correia vs. Marion Reneau – This one should be close, as both are strikers and I don’t think either has real finishing power. Correia is a combo striker, who can take damage and keep dishing it out. Reneau is a good striker too, who implements a healthy dose of kicks and punches. As for the winner, hmm…I’m going to go with the more well diverse Reneau to edge it out via decision. 170 lbs. : Tim Means vs. Alex Oliveira – This has “Fight of the Night” written all over it! I mean, you got two strikers who are willing to eat a punch to land a punch. Means, has some of the nastiest striking. He incorporates standing elbows like no other and he’s a guy who hits you with precise combos. He’s like a Diaz brother, but with a larger arsenal. As for Oliveira, he’s an aggressive, yet wild striker. For fighters who aren’t used to pressure, it could be a rough night when you face him. Oliveira’s bread and butter though is on the mat, where he’s the far superior grappler. However, his willingness to brawl doesn’t spell well in this matchup, as I believe Means will get the better of the exchanges. Eventually, landing the KO shot in the 2nd round. 155 lbs. : Kevin Lee vs. Francisco Trinaldo – What a Prelim Headliner! On one hand, you have a rising talent in Kevin Lee. A guy I personally believe will be vying for a title shot by next year. He’s got all the talent in the world, however his cockiness has been his downfall. Anyways, on the other hand, you have an absolute juggernaut in Trinaldo. He’s currently on a 7 fight win streak and quite frankly I’m not sure how he’s not fighting someone that in the top ten. Also, this is not a smart fight to take. As good as Trinaldo is one the feet and grappling, I think that Lee’s striking has evolved and his wrestling based grappling outdoes Trinaldo. I’m going to predict that Lee is going to wear down Trinaldo with his wrestling like Michael Chiesa did and eventually finish him in the third round via TKO! 170 lbs. : Sergio Moraes vs. Davi Ramos – Two high level Jiu-Jitsu practitioners, although you wouldn’t guess that Moraes was of late. He’s been enamored to striking, which is crazy given how good he is on the mat. But kudos, as he’s taken on his weakness and has really improved striking. Albeit sloppy and wild, he’s shown to have legit power. Ramos on the hand, other than his Jiu-Jitsu, I have no idea of his skills. So with that, I have Moraes via decision. 135 lbs. : Joe Soto vs. Rani Yahya – Another guy with cardio issues, is Rani Yahya. And, if I’m correct, I believe that the arena they are fighting in has no AC. That doesn’t spell well for an active grappler like Yahya, who will put his all into getting this one to mat. If he can’t, then he’s going to get pieced up on the feet by Soto. In fact, I think Yayha will have mild success taking Soto down, but will gas himself out in the process. I believe that Soto will weather the early storm and take the later round en route to a decision victory. 155 lbs. : Josh Burkman vs. Michel Prazeres – At first I was thinking, Burkman should win this. He’s a good wrestler and he’s got better striking…but then I remembered that was about six years ago. Prazeres, while many might not know, has actually fought seven times in the UFC. He’s 5-2, with lone blemishes over Paulo Thiago and Kevin Lee. He’s going to be the better fighter anywhere this fight is, as Burkman is a shell of himself at this point. So with that, Prazeres extends his winning streak to four via submission, as Burkman’s cardio fails him late. 145 lbs. : Rony Jason vs. Jeremy Kennedy – Man talk about wasted talent…Rony Jason looked to have serious potential. However, his cardio, wild striking and often back to mat in fights have cost him over and over. But, since I have no idea who Kennedy is, I’m willing to forgive and forget Rony Jason. So with that, I got Rony Jason via decision! 185 lbs. : Paulo Henrique Costa vs. Garreth McLellan – Never heard of this Costa cat, but I’ve seen McLellan several times. In fact, I’m surprised he’s still in the UFC because he’s really not that good to be frank. So with that, I got Costa via KO in the first round.